Known for her great charisma and happy disposition, well-loved by the people of Vigan and consistently the first councilor, the only princess of the council has now become the queen. Former Councilor Lourdes DG Baquiran, is now seated as the Vice Mayor of Vigan, after the victorious ascent of former Vice Mayor Ryan Luis V. Singson to Congress. As a legislator, she has chaired the Committees of Social Services, Women and Family Affairs, and Public Infrastructure. She has also sponsored resolutions various establishing the perimeter fence of the Provincial Model for Senior Citizens in Ayusan Sur, like establishment of Bahay Kalinga for the welfare of vagrants and the mentally derange victims of child abuse and the resolution providing benefits for solo parents. She was also the main author of the Gender and Development Code of Vigan and co-sponsored ordinances requiring all government and private establishments to have trained first aiders, the ordinance on the curfew of minors, and the implementation of the Comprehensive and Integrated Delivery of Social Services. 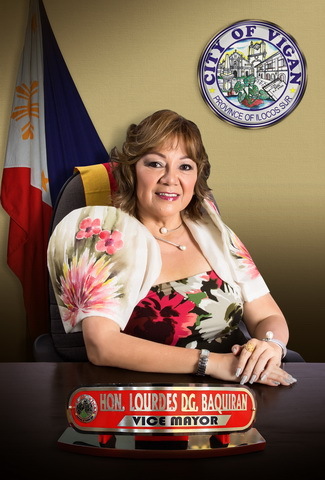 Vice Mayor by divine intervention or simply destined to be, Vice Mayor Lourdes Baquiran vows to uphold her advocacy to enrich and inspire the lives of Bigueños through good governance. That's her mission and vission in life hopefully, she will succeed. • CO-AUTHOR: AN ORDINANCE REQUIRING OWNERS/OPERATORS OF WATER-BASED PUBLIC RECREATIONAL CENTERS TO PROVIDE A DULY TRAINED LIFEGUARD IN THE OPERATION OF THEIR FACILITIES.